When smartphone manufacturers first release new handsets many of them will at first only come with a couple of different colour options. Later on though we then normally start to see more options become available and these can often be to celebrate various occasions. 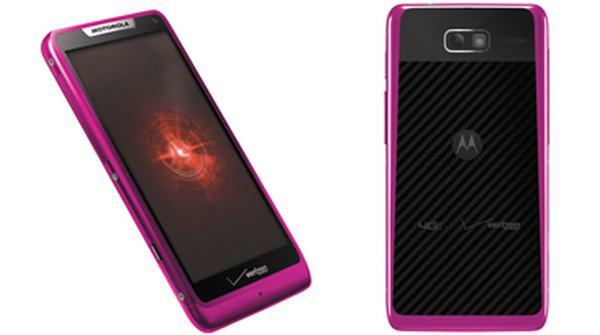 We maybe still in January but Verizon Wireless has announced a Red Nokia Lumia 822 and a Pink Droid Razr M for Valentine’s Day. Many smartphone owners like to own something a bit different and will often fit their handsets with a colourful case or bumper to personalize the handset a little, but with these new colour options from Verizon customers of the carrier can now own a brightly coloured handset without a case. Both the red Lumia 822 Windows Phone 8 device and the pink Droid Razr M are available now with the Lumia 822 costing only $99.99 after a $50 mail in rebate, and on the condition of a new two year contract. The carrier first got the handset back in November and features a 4.3-inch touchscreen display offering a resolution of 800 x 480. This is powered by a dual core Snapdragon S4 processor clocked at 1.5GHz, and camera wise there is an 8 megapixel unit on the back with a 1.2 megapixel front facing shooter. While the brightly coloured pink Motorola Droid Razr M will also set you back $99.99 with the same two year contract and $50 mail in rebate. The handset also has a 4.3-inch display with a resolution of 960 x 540 with a dual core Qualcomm Krait processor clocked at 1.5GHz. To find out more about the pink Droid Razr M click here, or for the red Nokia Lumia 822 click here.